Until Alex was 13 we lived in a small mid-western community where Alex was just one of the kids. To help her 1st and 2nd grade classmates learn about down syndrome Alex and I read "Our Brother has Down Syndrome" in the beginning of each school year. Our goal was to leave the kids with the idea that we are more alike than different. 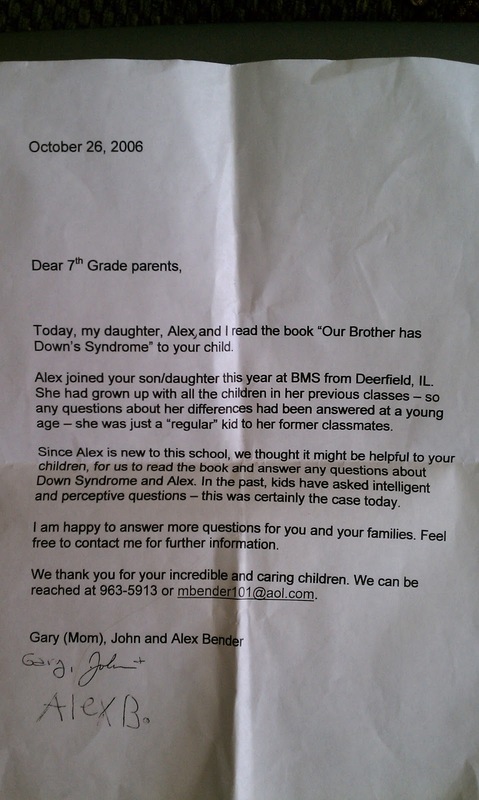 This was very successful and for the next five years in our IL school Alex and down syndrome were a non event. In 2006 as Alex entered 7th grade we relocated to beautiful rural Colorado. We moved to a community that has few students with down syndrome, and an education system not used to including students with special needs in the school community. This has changed dramatically in the six years Alex attended classes in our school district and seems to be improving every year. The kids in our new school district were welcoming and kind but true friendships were never made. Alex was accepted for what she had, now who she was. I believe this was for a number of reasons as generic as being the "newcomer" in a school where every student played with each other as babies. Specialized reasons included a place where students had never met someone with special needs who had early intervention, intensive speech therapy, played sports and could read and do math almost as well as them. Funny, I had forgotten about this...but it must have changed one person's perception of Alex and the Bender family, maybe these women are not just acquaintances, rather just a different type of friend.